As a pet owner, your goal is to always do what is best for your animal’s health. Centretown Veterinary Hospital’s dental focus will help you in making the best decisions for your pet’s dental health. You may ask, “why is a dental cleaning at a veterinary hospital is so much more expensive than that offered by a groomer?” Here’s the answer. Cosmetic Dental Cleanings or Anaesthesia-Free Teeth Cleanings refers to hand scaling the visible crown of the tooth on a dog. These ‘cleanings’ are done while the animal is awake, thus requiring restraint for the entire procedure. Since this is an unpleasant feeling it can develop fearfulness or aggression when examining the mouth in the future. With a sharp tool, the visible tartar and plaque are scraped off. As enticing as this may sound, this ‘cleaning’ does not allow for any oral disease to be treated above or below the gum line. In many circumstances, as the person performing the cleaning does not hold any credentials, damage may be done to the connective tissues around the teeth. Also, the grooves left in the enamel after scraping cause faster plaque build up since the teeth are not polished smooth after the scaling. A comprehensive oral health exam and treatment, otherwise known as a COHAT, is performed by a veterinarian and a veterinary technician while the pet is under anesthesia. The technician will scale and polish the teeth, above and below the gum line, and take diagnostic radiographs of each tooth. The veterinarian evaluates the Xrays and every part of the animal’s mouth. Broken or diseased teeth are surgically extracted, and any necessary treatments are then performed. Compared to brushing teeth, this process is much more in-depth, therefore anesthesia is used to reduce stress and eliminate pain during the procedure. Bloodwork and a physical exam are necessary to evaluate anesthetic risks in your pet and to decide which medications are the safest to use. After completion of the COHAT, the veterinarian forms a plan to address any oral concerns and to implement preventatives for future dental disease specific to your pet. 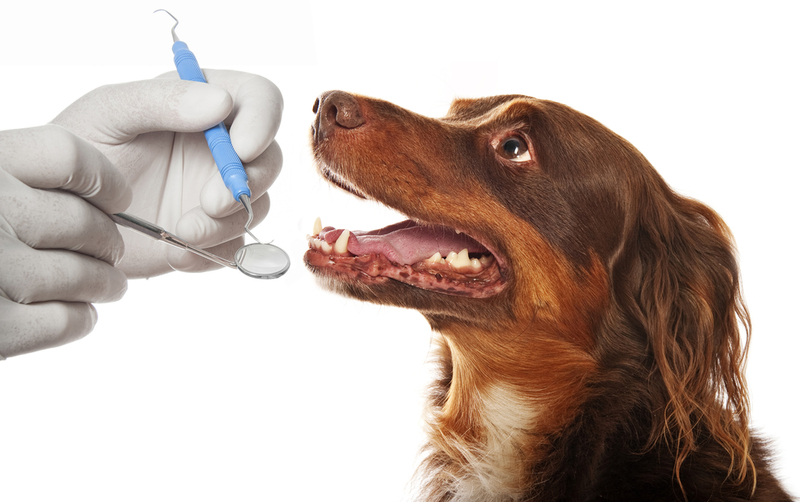 During annual or semi-annual physical examinations, the veterinarian will monitor the pet’s mouth for signs of dental disease and to continue the discussion of the individual pet’s dental needs. Overall, as appealing as an anesthetic-free dental cleaning may sounds, it may predispose your animal to future complications and will not be able to address dental disease above or below the gumline. The comprehensive oral health examinations and treatment is the only way to diagnose and treat dental disease. I encourage you to reach out to your veterinarian to discuss any oral concerns you may have and to discuss preventative care.